Mark Monitor helps keep .us domain registration records private. It’s been years since the average consumer could register a .us domain name using whois privacy, thanks to a decision by the National Telecommunications and Information Administration. But apparently if you’re a big brand you can still do it. 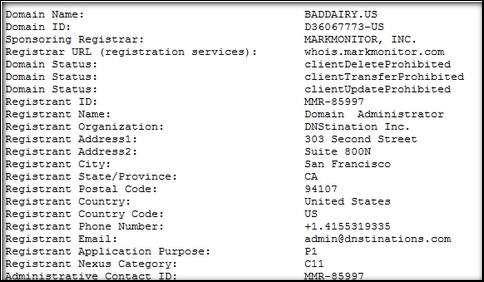 A company recently registered a slew of domain names related to dairy products, including BadDairy.com, DairyBad.com, and Bad-Dairy.com. Whomever registered these domains also registered versions under multiple top level domains including .net, .info, .biz, and .us. The domains were registered to DNStination Inc., an affiliate of brand protection company Mark Monitor. And make no mistake; DNStination Inc. is effectively a proxy service for Mark Monitor customers. admin@dnstinations.com is currently associated with about 20,000 domain names. Big brands tend to use this service when they don’t want to tip off that they’re the registrant of a domain name (at least yet). Let’s call a spade a spade: Mark Monitor is offering whois proxy services on .us domain names.